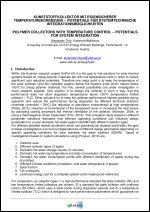 This research involves a direct solar (combi-)system for use in cool climates, based on vacuum-tube collectors, that uses night-circulation for frost protection, which doesn’t rely on pumped circulation, but also provides frost protection through thermosiphon circulation as a back-up in case of power/control failures. Furthermore, this direct solar system does not use a collector sensor or storage tank sensor, but instead has both the temperature sensors integrated into the pumping station. These features are achieved by using a Thermo-Differential Bypass Valve, which is installed on the storage tank at the solar inlet, and which only opens when the solar supply temperature is higher than the storage tank temperature and bypasses the storage tank when the supply temperature is lower than the storage tank temperature. The solar circuit can thus be free of check valves, so it is free to thermosiphon when the pump is off, and the collector circuit can be regularly circulated to measure the collector temperature at the pumping station, without sacrificing system efficiency. 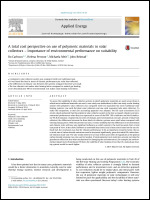 Within the Austrian research project SolPol-4/5 it is the goal to find solutions for solar thermal systems based on cheap polymer materials but with low temperature limits in order to realize significant cost reduction potentials. Therefore one major point is to keep the temperature of the solar collector (and the complete system) below the material limits which means below 100°C for cheap polymer materials. For this, several possibilities are under investigation in many research projects. One solution is to design the collector in such a way, that the performance does not allow stagnation temperatures above 100°C (temperature limited collector – TLC). 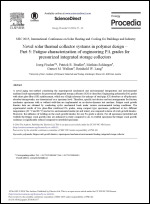 Other solutions try to keep the collector performance highest possible during operation and reduce the performance during stagnation by different technical solutions (overheat controlled – OHC) like reduction of absorption characteristic at high temperatures (Föste, 2015), reduction of transmission of the transparent cover or increasing the heat losses by activating cooling processes like internal ventilation of the collector (Harrison, 2004) or using a thermosyphon driven backcooler (Thür, 2014). 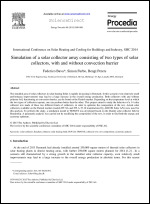 This simulation study based on different parameter variations estimates how different operating conditions can influence design parameters for a solar domestic hot water system (SDHW) with different collector types. For different possible market conditions, which can potentially be situated world-wide, the goal of these investigations is to find out dependencies of different design parameters depending on specific operating conditions for solar domestic hot water systems (SDHW). 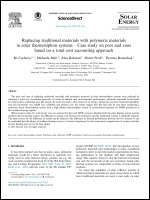 The pros and cons of replacing traditional materials with polymeric materials in solar thermosiphon systems were analysed by adopting a total cost accounting approach. In terms of climatic and environmental performance, polymeric materials reveal better key figures than traditional ones like metals. 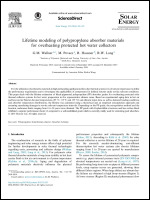 In terms of present value total cost of energy, taking into account functional capability, end user investment cost, O&M cost, reliability and climatic cost, the results suggest that this may also be true when comparing a polymeric based thermosiphon system with a high efficient thermosiphon system of conventional materials for DHW production in the southern Europe regions. When present values for total energy cost are assessed for the total DHW systems including both the solar heating system and the auxiliary electric heating system, the difference in energy cost between the polymeric and the traditional systems is markedly reduced. The main reason for the difference in results can be related to the difference in thermal performance between the two systems. It can be concluded that the choice of auxiliary heating source is of utmost importance for the economical competiveness of systems and that electric heating may not be the best choice. 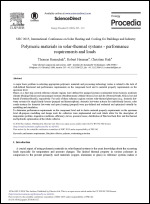 To assess the suitability of solar collector systems in which polymeric materials are used versus those in which more traditional materials are used, a case study was undertaken. 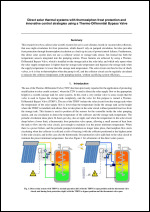 In this case study a solar heating system with polymeric solar collectors was compared with two equivalent but more traditional solar heating systems: one with flat plate solar collectors and one with evacuated tube solar collectors. To make the comparison, a total cost accounting approach was adopted. The life cycle assessment (LCA) results clearly indicated that the polymeric solar collector system is the best as regards climatic and environmental performance when they are expressed in terms of the IPPC 100 a indicator and the Ecoindicator 99, H/A indicator, respectively. In terms of climatic and environmental costs per amount of solar heat collected, the differences between the three kinds of collector systems were small when compared with existing energy prices. With the present tax rates, it seems unlikely that the differences in environmental and climatic costs will have any significant influence on which system is the most favoured, from a total cost point of view. In the choice between a renewable heat source and a heat source based on the use of a fossil fuel, the conclusion was that for climatic performance to be an important economic factor, the tax or trade rate of carbon dioxide emissions must be increased significantly, given the initial EU carbon dioxide emission trade rate. The rate would need to be at least of the same order of magnitude as the general carbon dioxide emission tax rate used in Sweden. If environmental costs took into account not only the greenhouse effect but also other mechanisms for damaging the environment as, for example, the environmental impact factor Ecoindicator 99 does, the viability of solar heating versus that of a natural gas heating system would be much higher. Ende 2015 began der Task 54 des Solar Heating and Cooling Programms der Inter-nationalen Energieagentur (IEA-SHC Task 54), Price reduction of solar thermal sys-tems. Ziele des Tasks sind Preisesenkungspotenziale für Solar thermische Anlagen zu identifizieren und konkreten technischen und wirtschaftlichen Pfade vorzuschla-gen, um die solaren Wärmegestehungskosten um bis zu 40 % zu reduzieren /1/. Kostensenkungen sind von entscheidender Bedeutung für die Branche, die seit ein paar Jahren mit einem Rückgang der Verkaufszahlen auf dem europäischen Markt konfrontiert ist. Im Rahmen des Tasks wurde daher ein transparentes Verfahren zur Wirtschaftlichkeitsberechnung und eine Kennzahl entwickelt werden, um das Preis-senkungspotenzial unterschiedlicher Lösungen miteinander vergleichen zu können.